Every time I visit Orlando I base my trip around a number of things. First, location! 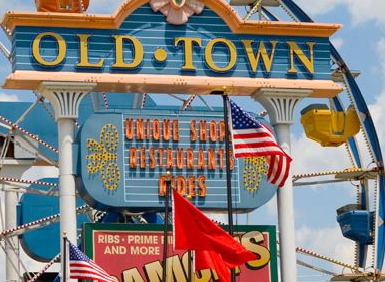 I like to put myself in a hotel that has a great transportation and lodging package, but that is also close to the strip known as "Old Town". This walkable strip is really a haven for those who want to be able to get out and around, yet avoid the crazy drivers that Orlando is famous for. Old Town offers a multitude of things to do for everyone from children to adults. It has arcades, rides and specialty shops. But it also boasts a number of unique eateries and social bars. I have been traveling to Old Town since I was roughly 14 years old. As a High Schooler I would ride mechanical bulls, in college I would check out the bars, and as an adult I like to take my kids around to different rides or to enjoy a cotton candy. Old Town is truly a gem of Orlando and its close proximity to the parks and affordable lodging is really a must see!